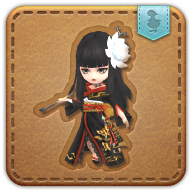 Summon your wind-up Yotsuyu minion. For that delicious disdain you never knew you needed. Searching for artistic inspiration, a goldsmith chanced to see an imported painting of a Doman beauty. The woman was apparently a renowned courtesan, and her exquisitely haughty features so enthralled him that he decided to immortalize her in mammet form. Sets a trap which can be activated by button after 10 seconds. When triggered, it delivers an attack with a potency of 180 to all enemies within range.